I have no real way to know if this is true or not. I only have one test case scenario so far. But if it is true this eliminates a recurring problem I have. 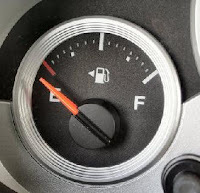 What side of your car (or rental car) is the gas tank on? Typically I try to use the side mirrors to sport a glance at the gas tank from the driver's seat. But this rarely actually works. Well this weekend my friend mentioned there was already a system in place to tell you exactly what side it is on. And to be honest I feel a little dumb not knowing this. The fuel gauge shows an arrow identifying the correct side. Usually next to the icon for the gas dispensor. I'm just not sure if this is universal but at least it's something to try before getting out.